500 square feet may not seem like a lot of space. But to some, it’s more than enough to create a comfortable and welcoming home. And we have more than enough of these tiny apartments waiting to give us inspiration right on our own website. We gathered a list of our top 10 tiny apartments on Freshome under 500 square feet, and love what we found! Whether it’s a smart layout for a studio or a creative way to divide space, these tiny apartments all have something worth seeing and applying to our own spaces — no matter the size. And shouldn’t be! 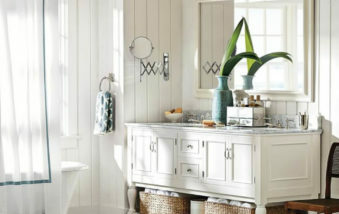 White set the stage for nearly all of these homes, keeping the spaces bright and clean. Wild wall colors are fun, but we’d suggest saving your favorite shades for a punch of color in an accent piece: pillows, furniture, artwork. Just give yourself a blank slate to start with. Want to create different living spaces in a studio? Consider your lighting. 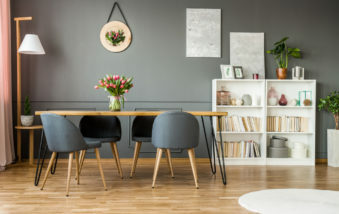 A floor lamp in a reading nook, an Edison bulb chandelier over a dining table, string lights over a bed all can be turned on or off to designate which space is in use. Half of the tiny apartments on our list are located in Gothenberg. Either we have a lot of readers who love Sweden’s second largest city, or these tiny apartments have been widely popular due to how minimalist-yet-chic they are. We’ll going to say it’s both reasons! 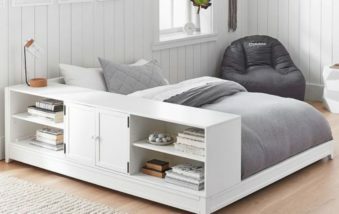 The smaller the apartment, the better the storage needs to be. This urban apartment embraces a couples’ need for maximized storage and multi-functionality with a sliding wall cabinet that includes space for dining, working, laundry, and of course — storage. Aside from this custom push-and-pull piece, the apartment itself remains simple, bright and open. The minimalist furnishings make the space look spacious while complementing the original character of the brownstone building. The bedroom is literally a room with a bed, but doesn’t it look so wonderful anyway? Overlooking the bustling Kungsgatan (King’s Street), the vibrancy of this district flows in from the street below to the small balcony and through the apartment. Color and light create whimsy and playfulness throughout the space. Open shelves to enhance the spacious feel of the kitchen and showcase classic white subway tiles beneath. Unique furniture gives a retro, flea-market glamourous look to this apartment. Among our favorites: the wooden dining table, light-blue refrigerator, and red oriental rug. The living room and bedroom are separated by rustic wooden doors, reflecting the turn-of-the-century character of the building. For a couple that is constantly on the road, a simple and uncluttered place to call home is the key to their sanity between trips. A giant pegboard spans the shared kitchen and bedroom wall, with a half-utilitarian, half-youthful, completely original look. Add on to that a cargo net to define the bedroom space without losing light, and plywood that looks just finished enough to look intentionally raw. A coat of pastel blue on the walls further softens the space, along with knick-knacks and geometric artwork that reflect the modern tastes of the nomadic couple. Designer Szymon Hanczar has everything at his fingertips living in the center of bustling Wroclaw, Poland. Which is why when it comes to his living space, more isn’t merrier — or even merited. Claiming that 13 [square meters] is his lucky number, Szymon’s apartment is minimalist, manageable, and slightly reminiscent of a college dorm (but much cooler). Playful elements such as a ladder, hammock, and hanging bike rack do double duty as decor and function. The simple space keeps thoughts and things organized for a life primarily lived out and about in the city. There are so many elements to love in this urban flat. The building’s character brings 10-foot ceilings and large windows for a bright and spacious base. Adorned in traditional Scandinavian style, patterns dress up the monochromatic palette and bring in modern lines. The bedroom feels surprisingly secluded, only separated from the main living space by a half wall. One of the largest spaces in this apartment is the outdoor patio, acting as a second living room to enjoy the pulse of the city. 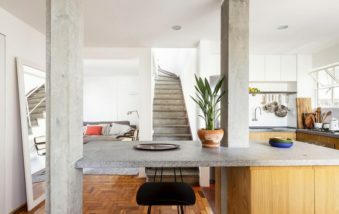 When an architect bought this sweet apartment in an older building, the biggest change she made was to knock down a wall separating the kitchen and living room. Now, the only element that defines the two spaces is the change from tile to vintage parquet flooring. A soft gray wall color merges the white European kitchen with the expertly mismatched style of the living space. The powder blue loveseat steals the show, but every piece of furniture adds a special something to this sweet space. This studio living space feels much larger than it actually is, due to high ceilings and an open, uncluttered layout. 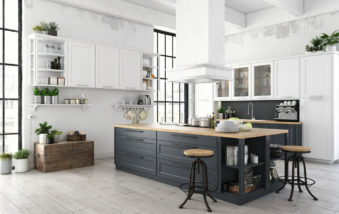 We adore the dark gray cabinets found in the traditional IKEA kitchen, giving the space sophistication and functionality. The living space takes on a monochromatic color palette with modern industrial pieces. Bright light streams in from large, original windows and gives insiders a look at the spacious iron-enclosed terrace spanning the apartment. With dormer windows and tall vaulted ceilings, this attic apartment breaks tradition from dark and cluttered attics. 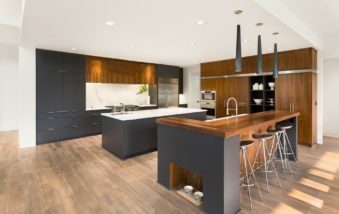 The modern kitchen is a stunner, with flat-fronted hardwood cabinets spanning the galley design. Black wooden beams add character and enhance the black and white color scheme. Modest furnishings include a simple card table in the dining space, and wooden chairs in a cozy living room nook. And speaking of cozy — a bedroom tucked in a corner room seems like the perfect spot to curl up. Previously divided into four rooms, this Paris apartment was once dark and crowded. 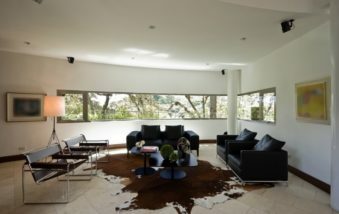 By removing the walls and creating a studio space, the entire living space now benefits from the large windows. A modern kitchen is made of a mosaic of white and plywood pieces, and the bathroom is ultra-modern (but very tiny) space with the prettiest green tile pattern you’ll ever see. Minimalist fixtures and furnishings keep this apartment simple and delightful. Here’s something you don’t see every day — a bedroom with glass walls! This Stockholm apartment boasts the ultimate transparency with this sleek space, but remains comfortable and welcoming with rustic accents like the twig stools and oversized candles. The mostly white color palette lets the Scandinavian influence shine, and certainly, the sun shines on this apartment’s relaxing patio, as well.